Results for Product Code "V-ESSSTD-HS-P01AR-57"
You are busy, and managing IT on your own is no easy task. You need a backup solution that just works, is hassle-free, and that saves valuable time so you can focus on growing your business. Stop wasting time managing legacy backup solutions and switch to Veeam, the affordable and worry-free solution that you can trust will deliver the Availability, automation and reliability you need to ensure that your business is Always-On™. 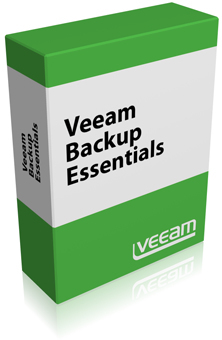 Veeam Backup Essentials is the ultimate small business pack, delivering the same functionality of Veeam Availability Suite™ at HALF the price! It is specially packaged and priced for small businesses with virtual environments of 2, 4 or 6 CPU sockets, typically found in companies with fewer than 250 employees.Does your environment have more than 6 sockets? Click here to view pricing for environments of any size. - 2-in-1: backup and replication™ — Improve off-site backup and recovery with WAN-accelerated replication, replication from backup and 1-click site failover, with support for planned failover. - Instant VM Recovery® — Recover a failed VM in less than 2 minutes. - Veeam Cloud Connect — Easily extend your data center off site with fast, secure cloud backup and replication. - SureBackup® — Test every backup, every time, before launch and ensure full recovery. - FULL integration with Microsoft 2016 data center technologies including Windows Server 2016, Hyper-V 2016 and the 2016 versions of Microsoft enterprise applicationsNEW. - Veeam Explorer™ for Microsoft Active DirectoryENHANCED — Instantly recover individual Active Directory objects and entire containers, as well as user accounts and passwords. Also supports expiring links between objects. - Veeam Explorer for Microsoft SQL ServerENHANCED — Get fast transaction-level recovery of SQL databases and restore SQL databases precisely to a desired point in time. - Veeam Explorer for Microsoft ExchangeENHANCED — Get instant visibility and granular recovery of individual Exchange items, including hard-deleted items you thought were lost forever. Veeam ONE, an essential part of Veeam Backup Essentials, provides complete visibility of your virtual and backup infrastructures through powerful and easy-to-use monitoring, reporting and capacity-planning tools. Veeam ONE’s automated 24x7 monitoring and alerting notify you about backup and performance issues before there’s an operational impact. Veeam ONE also includes 30+ pre-built backup reports to help you maintain backup visibility.